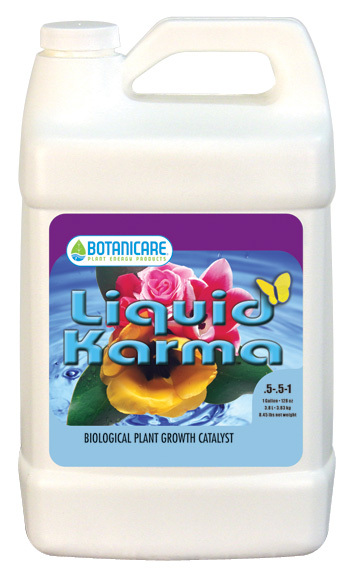 Liquid Karma 0.1-0.1-0.5 represents a significant break through in plant nutrition. This is be cause it contains a full complement of metabolically active organic compounds not found in regular plant foods or supplements. These unique compounds are absorbed immediately and act as regulatory signals, activators or catalysts to produce synchronized and accelerated growth under all conditions. Liquid Karma functions as a growth engine because its high metabolic activity produces a large amount of energy, which is immediately transformed to growth. It contains fermented compost, Amino Acids, vitamins, plant extracts, Humic Acid, Seaweed Extract and carbohy-drates.